Special Counsel Robert Mueller had the FBI arrest Roger Stone this morning, and while we all knew it was coming eventually, the indictment itself may prove to be the real story here. It alleges that a senior Donald Trump campaign official was instructed to have Stone remain in communication with WikiLeaks, and report back about anything damaging to Hillary Clinton. This official is Steve Bannon. How do we know? The first clue was the quote in the indictment from the unnamed campaign official, which matches up identically with an earlier Steve Bannon quote published in the Washington Post. The second and more direct clue is that CNBC is now flat out reporting that the campaign official is Bannon. So this changes things quite a bit. Steve Bannon has reportedly given dozens of hours of cooperative testimony to Robert Mueller. But now that we know Bannon was knee deep in Trump-Russia election collusion, mere cooperation wouldn’t be enough to get him off the hook. 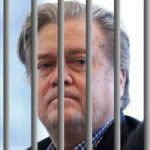 In fact, the only way Bannon isn’t getting indicted and arrested is if he’s already secretly cut a plea deal with Mueller, which is entirely possible, though no direct evidence of this has surfaced as of yet. So yeah, Steve Bannon is going to be arrested if he hasn’t flipped already. When? We have no idea. But it’s clear that Robert Mueller is now putting things in motion. There’s no reason to arrest Roger Stone yet unless Mueller is planning to use it to swiftly move on the related bigger fish. Here’s the real kicker: who directed Bannon to have Stone collude with WikiLeaks? The indictment doesn’t say – but Bannon would only have taken instructions from Donald Trump himself, or perhaps a member of Trump’s family.